First of many beers in Germany. This was at our hotel the night we arrived. 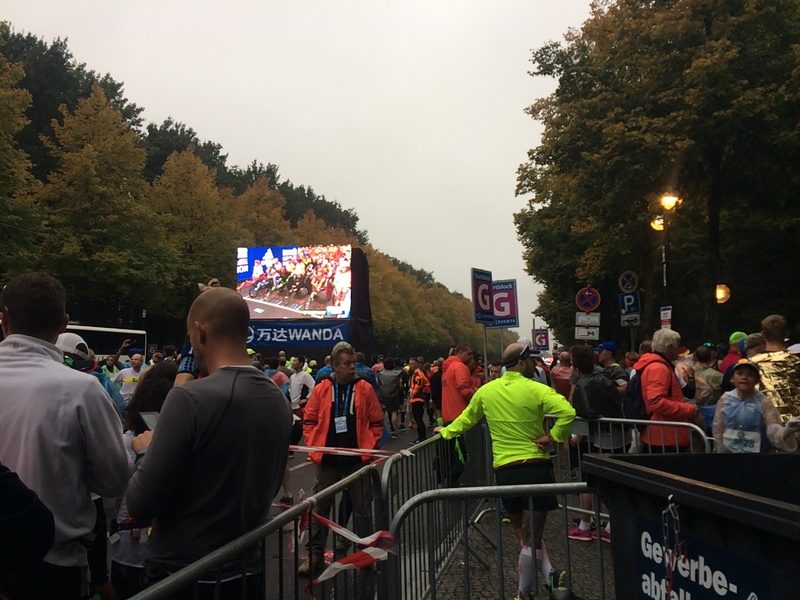 The Berlin Marathon, my second race in the World Marathon Majors, was an overall great experience. Given that my least favourite races tend to be the larger ones, I had tempered my expectations of what type of experience I would have. As a result, I came out of it enjoying more than I anticipated. We flew from London to Berlin on the Thursday night (race on Sunday morning), and a women we spoke with in line at immigration as we entered Germany said she was there to support friends running in the race. 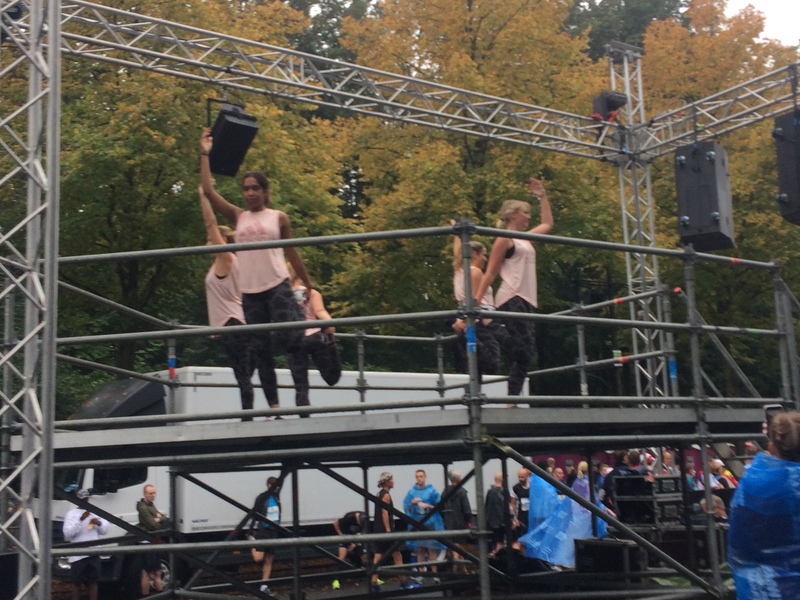 As a native Berliner (who currently resides in London), she said that the city treats the event like ‘Super Sunday’ and that it was a well supported, well loved event in Berlin. That’s a good sign. We arrived without incident, and headed to our hotel the Courtyard Marriott, which was about 1.2 miles from the start/finish area. The plans for our time in Berlin were to head to the expo on Friday morning then enjoy some sightseeing in the afternoon and on Saturday, not knowing if I would be up for anything after running. This was a beast. With approximately 45,000 runners participating, you know this had to be an event of mass proportions. I would compare it in size to the Chicago marathon expo. The location was a few miles from our hotel, so we decided to walk it; although, the expo hall was a stop on the U-bahn train line for those who were not keen to walk. As we got closer, it was obvious that most other runners had the idea of getting in first thing on Friday to avoid the crowds. As a result, we waited in a line for about 20 minutes just to get to the entrance of the expo! But as is true German fashion, things were very organised and orderly. At the entrance, participants were funneled into a separate line from non-participants. This was so we could go into the area to collect our race day items. First up was to get a wristband that they fit to your wrist. This wristband had to be shown on race day (along with your bib) to be allowed into the corrals. Actually, it was a great idea to help ensure bib swapping or banditing wasn’t an on the day issue. Next, there were at least 20 lines that you could go to in order to collect your bib. Just pick one and wait for your turn. You had to provide ID and your confirmation page (also had to present this to get into the participant area), and they printed your bib out right in font of you. Hmmm. I liked the idea, but as I found out later, that paper was no match for sweating and very drizzly/humid conditions. I had also rented a timing chip ($5 when I registered), so I received that as well. This seemed old fashioned to me to have to put a chip on the shoe, but as I saw at least a half dozen bibs on the course, lost along the way, it’s a good thing the timing chip wasn’t on the bib! Oh no, the alcohol free beer was a major sponsor of the race. Before leaving this area, I received a programme, my bag for bag check (as opposed to selecting the option for a poncho at the finish line, which is great to cut down on the bag check lines on race day! You could have one or the other. ), and I picked up a course map to help my husband find a few spots on the course where he could try to find me. I had also pre-ordered an event shirt, so my next stop was to go to Hall 8 to pick that up. I wasn’t fussed with the shirt when I saw it, but the cut is very flattering and it looks nice when I put it on. The biggest issue was trying to get through the hordes of people and make my way all the way across the expo to get it. That was a bit annoying. At this point, it was so crowded inside that I was thankful Chris and I had decided on a meeting point and time, otherwise we never would have found each other in the organised chaos that was the expo. Which is basically what happens when you have that number of people involved. I wasn’t able to get my free engraved charm from BMW, as I wasn’t willing to stick around for two more hours. And when I realized that they said the ‘real crowds’ would be there on Saturday, I was just ready to find Chris and head out. We made a stop at Checkpoint Charlie, went to the museum there and eventually found some of the best pizza we’ve ever had for dinner at a small restaurant near the hotel. As a special bonus, there was a free 6K breakfast run available to participants (and others), so Chris and I decided to join in and stretch my legs a bit while running through another section of the city that neither of us would see otherwise. We headed to the start line by U-bahn, and it was really easy to get to. I mean on top of simply following all the other runners who were also headed there. I think there were about 5000 people at this event, which as it was free, is not surprising. There was no shirt, no medal and no timing chip; this was strictly for fun. The start at Schloss Charlotetenburg, where there was a festive atmosphere, complete with music, balloons and many, many people in costumes. I definitely enjoy seeing people have fun with running, and I was not disappointed. From the man in the luchador mask (along with his other Mexican compadres who wore a Mexican flag and sombreros) to someone in a kimono, I was definitely entertained at the start of the run. We counted down to the start, they released balloons (which made me cringe! People, stop releasing balloons! It ends up as trash for someone else, and many animals die every year because of getting tangled in or eating balloons and their strings. Just stop.) and we all took off. It was crowded the whole run. We enjoyed some gentle hills as we ran through the neighborhoods, anticipating the finish, which is really how I talked my husband into joining me. Really a balloon release? For a race that is proud of being ‘green’ this is a very contradictory statement. Please don’t release balloons – they end up as trash! 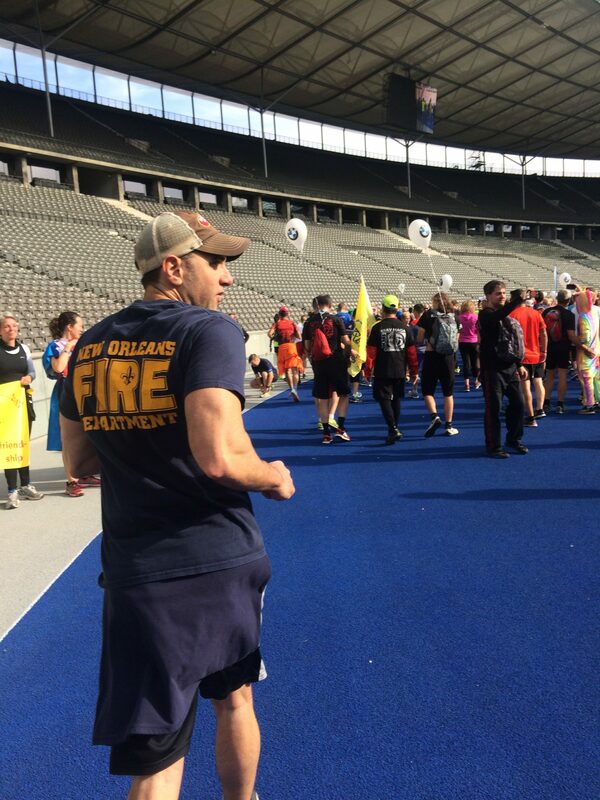 The finish for this run was at the Olympic Stadium. We ran the straight approach, seeing the stadium ahead for a few minutes, then were diverted to the left and headed into the tunnel, just as the Olympic marathon runners did as they chased Olympic dreams. This was a pretty cool experience, and as you would expect, traffic backed up as we got to the entrance into the stadium where people stopped to take photos and videos of the scene. It was awe inspiring. I could imagine what it was like for elite runners to have that moment, coming through the tunnel, only to emerge to a full stadium of fans cheering you on to the finish, just less that one lap around the track away. What a memorable experience to follow in their footsteps and have my own ‘Olympic lap’ as I thought of it. 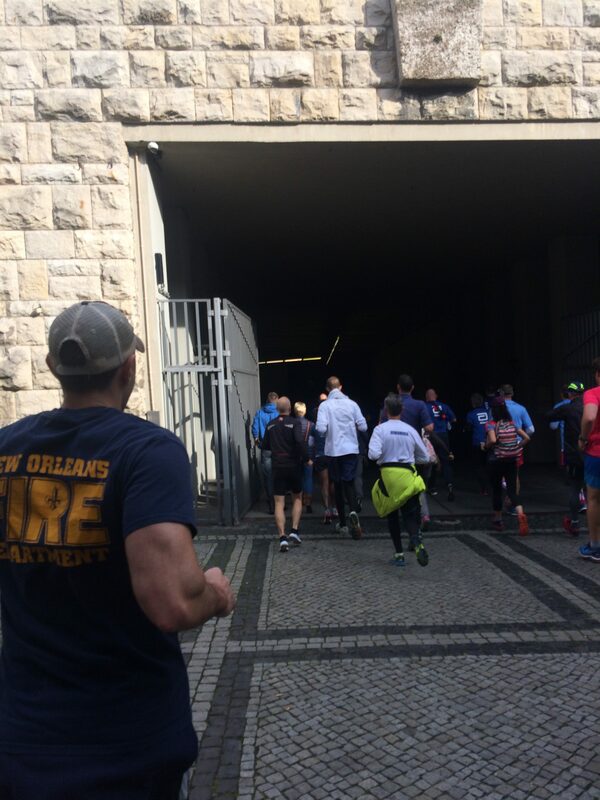 We ran to our finish then headed up the stairs to the exit, not sure where to catch the train. I know it was called a breakfast run, but as there was no registration needed or fee involved, I really didn’t expect breakfast. But I was surprised to find a while set up to grab water, coffee, croissants, fruit and berliners (jelly filled donuts that I discovered at the Dusseldorf Marathon). We wormed our was to the front of the crowds to grab a few things, Chris dropped my banana only to have some woman pick it up and walk away with it, and we followed the crowds to the U-bahn to head back. Stumbling stones – we learned on our walk how these mark the last known address of people murdered by the Nazis. Our afternoon was spent on a 3 hr walking tour of Berlin, making it two days in a row that I walked and/or ran at least 10 miles. Oooops. Pasta dinner at our hotel followed by an early bedtime, and then when I woke up it would be race day. This guy ran as the Brandenburg Gate – and still ran a faster race than I did! Race day was a gray, drizzle morning as I made my way from the hotel to the starting area. The rain actually stopped when I got there, but drizzle happened again while waiting in the corrals. Like everything else in Berlin, this was very organised, if not simply overwhelming due to the sheer volume of participants. We had a long walk to get into the corrals, which was why they recommend you get their early. And then I ended up at corral H, when I was in corral G. So I had even further to go. But along the way I saw a man dressed as the Brandenburg Gate, a major Berlin landmark, so it was worth the extra walking for me. To enter the corral, you had to show your bib (with corral letter on it to verify you were in the correct corral) and your cloth wristband they affixed at packet pick up. Without these two items, you were not allowed to enter the area. I found my corral and was delighted to see that there were ‘warm ups’ going on. I mean music, commentary and even people on stages going through warm up routines. And yes, runners were doing them, too! There were also large TV screens throughout the corrals, which showed various things before the start – video messages from runners, pictures and video messages from families, the race director welcoming runners, and most importantly, the start of the wheelchair race, the elite runners and all corrals. As I anxiously awaited my own start in the next to last corral, it was a nice treat to have the video boards to give us something else to look at – especially being able to watch the elite runners start their run. 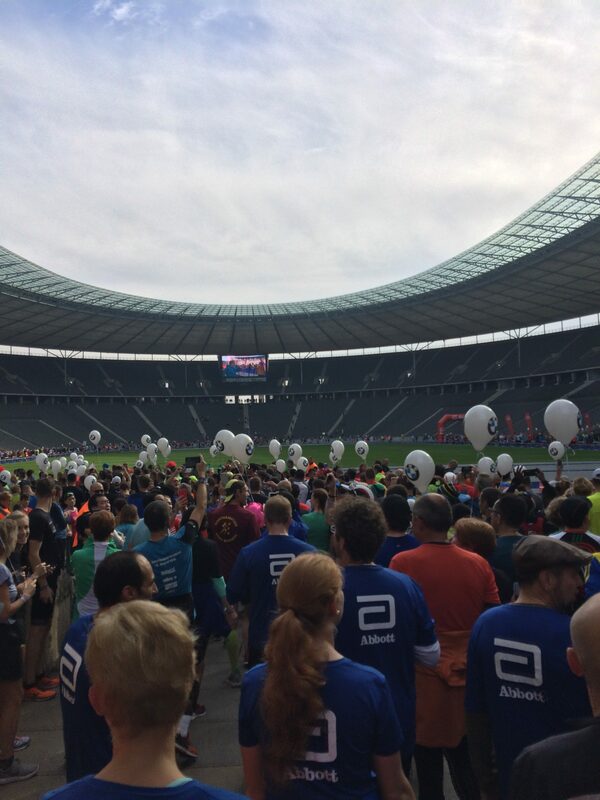 I chatted with a few others around me, some from as far away as Hong Kong, wished them well, and before I knew it, it was my turn to cross the start and #beatberlin42. Berlin is known as a flat, fast course, with 6 of the fastest 10 marathon times in the world. Conditions were cool and humid, so not ideal. I believe the lead runners were on pace for a world record perhaps as long as the 15 mi mark, but they fell behind a bit and no records were broken. I blame the humidity and wet conditions. Never was I not surrounded by a million of my newest running friends. That is the case when you participate in these large events. In some ways I hate it, but in other ways, it’s not a bad experience. You end up running to the pace of those around you, and as long as they are within my typical pace, I love it. It keeps me moving forward. I think my fastest mile was mile 5 with a sub-9 min mile. That concerned me a little as that is much faster than I should be going. However, there were some downhills in that mile and no aid stations, so it wasn’t as surprising upon further reflection. They only had stations set up on one side of the road, which in a large race like this means that people are cutting across the road to get to the water/tea/bananas. This can be dangerous and really makes aid stations an annoying aspect for people trying to run through them. They used clear plastic cups for the water. When these cups were thrown on the ground and got wet, from both the liquid in the glass and from the little bit of rain, they were slippery to run on. Another hazard that could have been avoided. I will say, it wasn’t anything as messy, gross, disgusting and dangerous as the Paris Marathon aid stations, so I won’t be too hard on this. More of an FYI. All aid stations had water and their energy drink, which I didn’t hate. It is much better than Garotade in my opinion. I made the mistake of grabbing the warm tea one time, which was a surprise, and not a completely unpleasant one. Just one I didn’t need to repeat. It’s not my race juice, so I tried to steer clear. I do appreciate that all aid stations were consistently the same order of items, so there was never any guessing where to go to get your beverage of choice. I was also thankful to have bananas at a number of stops to help me fuel; this was an especially important item to note because I was running through my lunch time. Having good food in my stomach to help me was a key to running a pretty strong race. Chris was waiting for my around 14km (mile 9), and I was able to see him in a pretty large crowd. Shortly after I passed him, I saw a runner down who was in serious trouble (eyes were rolled back in his head and a medical assistant was trying to get him laid flat on the ground to help him). It was a bit of a check to remind me that something can happen at any point, and that I need to enjoy the chance to get out there and enjoy my time on the road. I do hope he was ok. He was on my mind a lot for the rest of the race. Crowds were pretty good along the entire route, with good energy and more than 80 bands, I believe, for entertainment. Bands were few and far between in the first 6 or 7 miles, but were plentiful in the last half. I really enjoyed the drumming groups and had to do a double take of the ‘Ricola’ guys who looked like they arrived from the Swiss Alps with their alphorns. Seriously. DJ’s along the way were blasting some of my favourite running songs, and there were lots of little kids looking for high-5’s. I had fun. Final 0.1 miles just after running through the Brandenburg Gate. I’m all smiles knowing the finish is just ahead! This was a race where I didn’t talk to another runner on the entire course. That is very odd; I’ll usually carry on a small conversation or two with people as I go, but not at this race. I think I was just in a zone, enjoying the run. In fact, I was pretty strong and consistent for the first 21 miles, thinking I was capable of a 4:08 – 4:10, which would have been my second fastest marathon. Unfortunately, after a really great few miles from 18-21, I got heavy legs. It hit pretty quickly, and I wasn’t expecting it because the previous miles felt so good. I slowed down a little, had to walk a little more slowly through the water stops and just be ok with the situation that I wasn’t going to get under 4:10, but I knew a 4:15 was still a very realistic goal. Once I was going to push myself to attain. To help ease the frustration of my slowing down, I happily accepted a beer from some spectators who set up a beer stand at their cafe table across from the opera house. Thank you to you all – that is the type of support that I appreciate in those late miles when spirits and energy are sagging! As I made the final turn to run toward the Brandenburg Gate, 42km and then the finish, I took my phone out of my pouch to snap a couple photos. The phone shut down. So I tried to restart it, which always take a minute or two (but seems like 10 when you are coming up on a timed goal, of course!). I ran past my husband, kissed him and took off. I waited until I went through the Brandenburg Gate to turn on the final ‘sprint’, saw that my phone had turned back on, got my ‘almost done’ photo, and decided to push as hard as I could. And as I came to the finish line and saw I could get in under 4:15, I used my last bit of energy and crossed the line in 4:14:59. So yes, technically a 4:14 race. Good enough for my third fastest marathon time. The post race finish was a very large area, and spectators were not allowed in due to security and logistic reasons. So I had to walk out and find Chris as the appointed place we decided on the previous day. We received our medals, which were perfect for this race. The German flag ribbon was a great touch. I walked toward the exit, got my rain sheet/poncho, some water and found where to take my chip before leaving the finishing area. For those who weren’t as ready to move on with their day, they could grab their bag from bag check, take a shower in the shower area, change and enjoy some alcohol-free beer. Yes, that again, just like in Dusseldorf. Still not sure what Germany’s deal is with that. So you bet my first stop after finding my husband was to go to a brew house and grab a beer or two. (I did grab an alcohol free beverage, drinking about half so I could get something carbonated into my stomach, which always seems to help me at the end of a race. I had to notice that the post race area had organised trash. This was not the only place where people neatly stacked cups rather than just throwing on the ground near the bin. There was also a large ‘reunite’ area, just outside the finishers area. It was divided into letters to help people find each other by last name (or whichever letter at which they wanted to meet). In all, coordinating 45,000 runners and the many thousands of volunteers is never easy, and yet, they were on the level of Chicago in achieving their goal. Chris and I located each other pretty easily once I was out, and we went to a brew house he found earlier. I grabbed a kolsch, the traditional beer of Koln (Cologne), and some french fries, which I dumped a bunch of salt on them to help me get back to normal. After changing clothes to dry clothes and finishing my beer, we headed back to the hotel, where after another bit of beer, I had to go to bed. I was exhausted. Happy and exhausted. We left Berlin the next morning to continue our Germany adventure, with an early flight to Saarbrucken. We then travelled about 170 miles on bike through the Saar and Mosel River valleys, enjoying the beautiful countryside and helping me to recover from my race. Of course, I picked up a bad cold on the way, which seems to happen after most marathons I’ve run. I definitely left Berlin with great memories of a fantastic marathon experience. If you enjoy large races or simply appreciate a well run race, this might be a good option for you. Enter the lottery – you seem to have a good chance to get your entry that way! Sounds like a fantastic flat & fast race! Can’t believe alcohol free beer though post race in Germany of all places!! They will have to work on that!! lol Congrats and well done!! Yes, it was pretty flat. 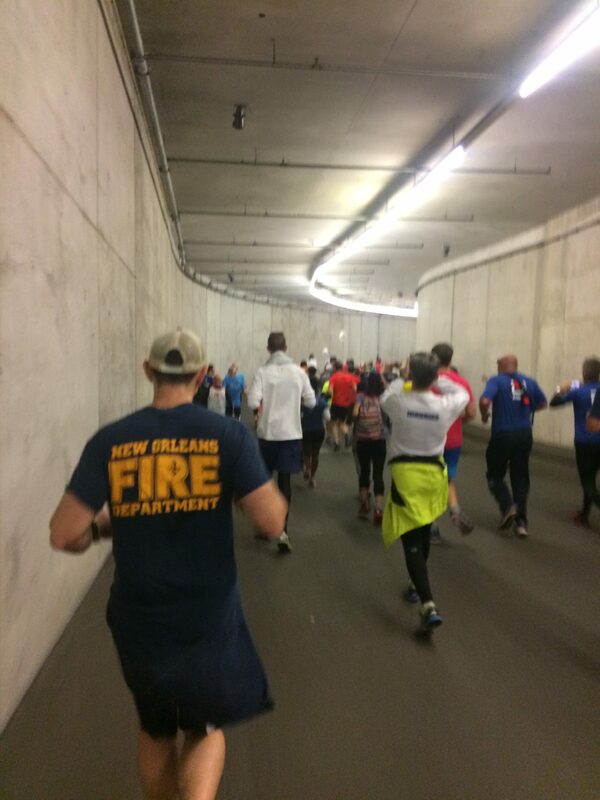 There are some very gradual inclines as you run on overpasses, but it’s known for being a fast course. And that alcohol free beer…Germany, you let me down on this one aspect of the race!!! this race looks like a huge amount of fun! I’m super impressed by the costume runners, I’ll never know how they can post such fast times in those costumes! Thank you for writing this! I’ve done Chicago the past two years and loved it. I know today is the last day for me to throw my name into the Berlin lottery and I was going back and forth. You helped me decide. Thank you! I think that means you are entering the lottery…and if so, good luck! Races in Germany are always well organised and run. I had a great time, even with a drizzly, gray day. It’s definitely worth running!